Welcome to those of you joining me from A World View and those of you just hopping aboard. I am the 3rd stop on our Magical Blogorail. For this edition of Magical Blogorail, Disney Dad shares some thoughts on some of the souvenirs he has collected over the years. 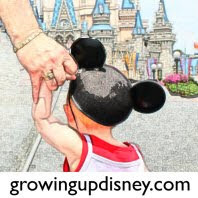 When Amy asked me to write this Blogorail article for Growing Up Disney, I thought; ”what is my favorite Disney souvenir?” I have been going to Walt Disney World since it first opened and have picked up many “things” over the years. I have the requisite t-shirts, polo shirts, and baseball hats. I have a few watches and some screensaver programs I picked up over the years. I bought a wonderful EPCOT 30th Anniversary print (you can see it here) that I had signed by the artist, Larry Dotson. We have purchased 3 prints of artwork by David Doss. I have a copy of the 1980 D-shaped book “The Story of Walt Disney World” we bought at the Magic Kingdom. And in a drawer is even a plastic wine glass that says EPCOT International Food and Wine Festival (no date, so I don’t know what trip that was from). All of my Disney baseball hats have collectible pins attached. I have been asked many times by cast members if I would like to do some pin trading, which I’ve always turned down. One cast member offered to give me every pin she had for my one, which I respectfully refused. See, all of my pins are “special” I picked them out because I liked them, not to trade. Most are attached with a “permanent” catch that replaces the Mickey-eared pin back so they don’t come off easily. (You don’t lose the pins and grandkids can’t pull them off the hat.) On one hat I have a US Flag-Mickey icon shaped pin that DVC gave to members after 9/11. I have a pin that looks like a Mickey Mouse Sheriff Badge on one hat. I bought it because my great-uncle that I grew up next door to always called me “Sheriff” when I was little. I have a “Sorcerer Mickey” pin, as that is my favorite Mickey roll when he appeared in Fantasia. As I sit here writing this, I have a Mickey Mouse Clock on the wall my wife found at an antique store and there are 3 sericells bought at the Disney Store. I have on my latest Mickey Mouse watch I bought at Disney’s Hilton Head Island Resort last January, but none of these are my “favorite”. The three sericels in my "computer room"
As strange as it seems my favorite “souvenir” from my trips may just be the Mickey Mouse socks I am wearing. I have a drawer full of the short top white Mickey Mouse socks and I wear them almost every day. 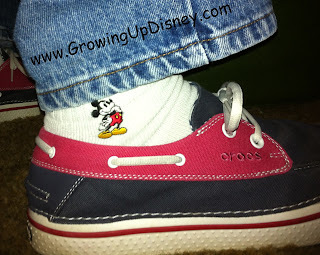 If I have on a pair of “casual” - tennis/athletic/walking - shoes, I have on my Mickey socks. Mickey Mouse socks – my favorite “souvenir” I have bought at WDW. My absolute favorite souvenir that I have brought back on every trip I have ever been on are the memories. I went to the Disney Preview Center in 1970. I have memories of going with my parent when the Magic Kingdom first opened in December, 1971. I remember how tickled my mother got when, on the Jungle Cruise, she thought an elephant was going to “reload” its trunk and squirt my dad. I remember taking my new bride to the Magic Kingdom on our honeymoon on Christmas Eve 1973. I remember sitting on Main Street, USA with my daughter to watch the 3 o’clock parade when she was 3 or 4. I remember the joy of my son on his first trip and the Chip and Dale stuffed animals he had to bring home (which Ridge still has). I cheered my daughter along as she ran the Disney Marathon in 2005 and Mom and I ran the “we’ve got to get to the next park to see her run through” marathon. We met with the wedding planners the next day. I remember walking my daughter down the aisle at the Wedding Pavilion and how happy she was and I was able to perform the wedding service to marry her and my new son(-in-law). When my father passed away, after the funeral, my wife and I went to WDW for a few days to “decompress”. Amy asked could she come and crash on our couch at Old Key West. The first night there as we watched Illuminations, she told us she was expecting. Anyone watching us probably thought we’d never seen fireworks before. A few years later I took my granddaughter (Tink) by the hand on her first steps on Main Street (see the GrowingUpDisney logo for a picture of that). I repeated that memory with my second granddaughter (Minnie), holding her hand on her first steps down Main Street. We learned of Minnie coming at dinner at Olivia’s at Old Key West when Amy brought Tink out wearing a shirt that said “I’m the BIG SISTER”. There are so many more memories I have of trips to WDW over the years. The memories I have brought back from WDW have to be the absolutely best souvenir. We try to share some of those memories at Growing Up Disney. I hope you enjoy them too. There are even pictures of some of them. 3rd Stop ~ Growing Up Disney - You are here. Love all of your souvenirs!! Such beautiful Disney memories, with lots more to come. I think the Mickey Sheriff pin is my favorite. The Sheriff pin has 2005 on the back. So I have hade it for a while. It's one of my favorites too. I have to agree with Amy. Reminds me of all of our memories from WDW. I love to watch my kids "grow up Disney" and can't wait to see what our future brings. Thank you for sharing! Thanks! I just hope the further the people who run Disney get away from Walt they don't forget 2 things. Walt wanted to build a family place he could take his daughters and "it was all started by a Mouse"
What wonderful Disney souvenirs and memories you have to cherish! You do have the best souvenirs of all, a wonderful set of memories that truly last many lifetimes. But you also have a Mickey watch, which is something I haven't been able to find for myself yet. Maybe this coming trip. Bruce, The watch I'm wearing now is a "Disney Parks Original" brand. I saw it at WOD for $75. I bought mine on sale at Hilton Head DVC on sale for $45. You can buy them at WDW for $30 or $300. Just depends on how much you want to spend. I have my eye on a $300 Citizen Mickey Mouse watch. So far I haven't brought myself up to spend that much on a watch. Wonderful post! Love the memories!!! As someone coming late to the party, thank you for sharing your memories - some truly awesome ones - and your souvenirs are stunning! Photo Flashback: Remember The Big Red Boats? EPCOT Center 30th Anniversary: we were there!